I hope everyone had a great holiday weekend! I took a few days off to enjoy a family vacation down in Charlotte 😀 We had lots of good food, laughs, a white water rafting adventure, and more… Not to mention a short respite from the never ending New England winter! 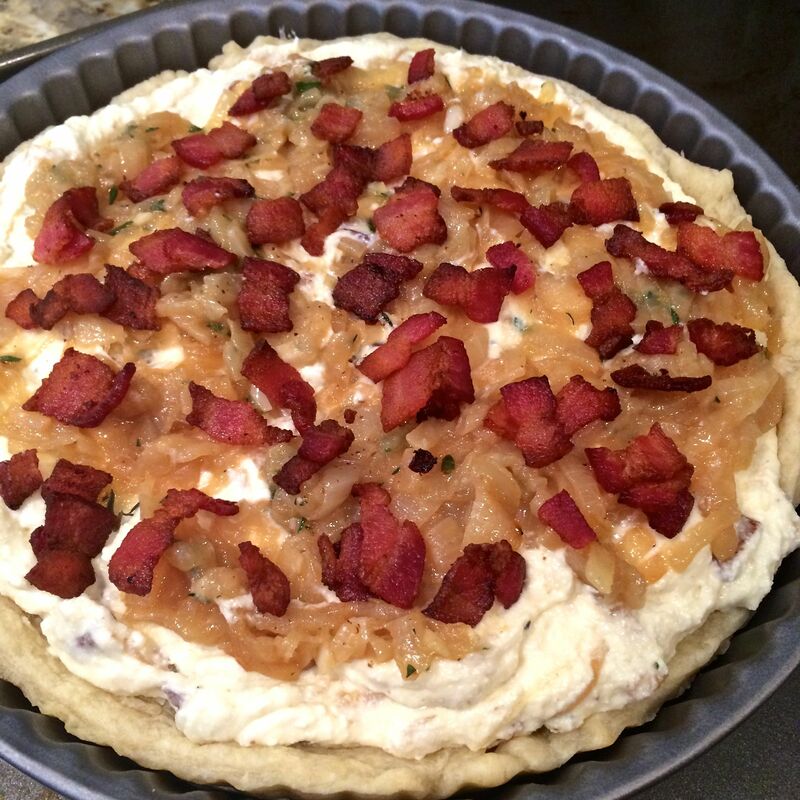 Now I’m back, bearing gifts of bacon, ricotta, and caramelized onions. 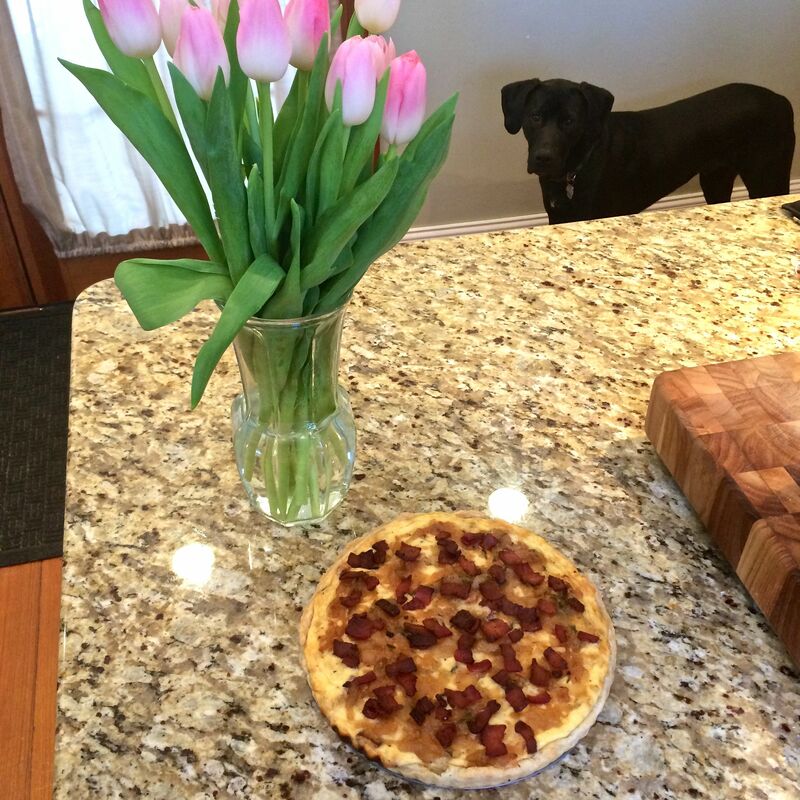 This tart is a labor of love, as each step takes some time. 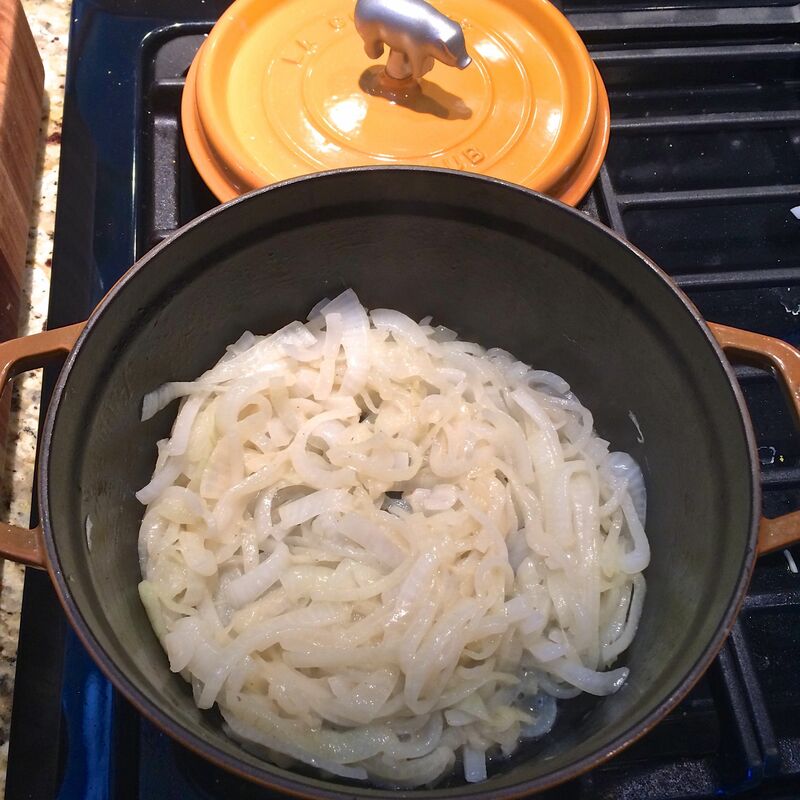 Starting with a homemade pie crust, patiently awaiting the caramelization of the onions, par-baking, resting, cooking, cooling…it’s a lot. However, I must say that this is one of the best things I have ever made. Ever. 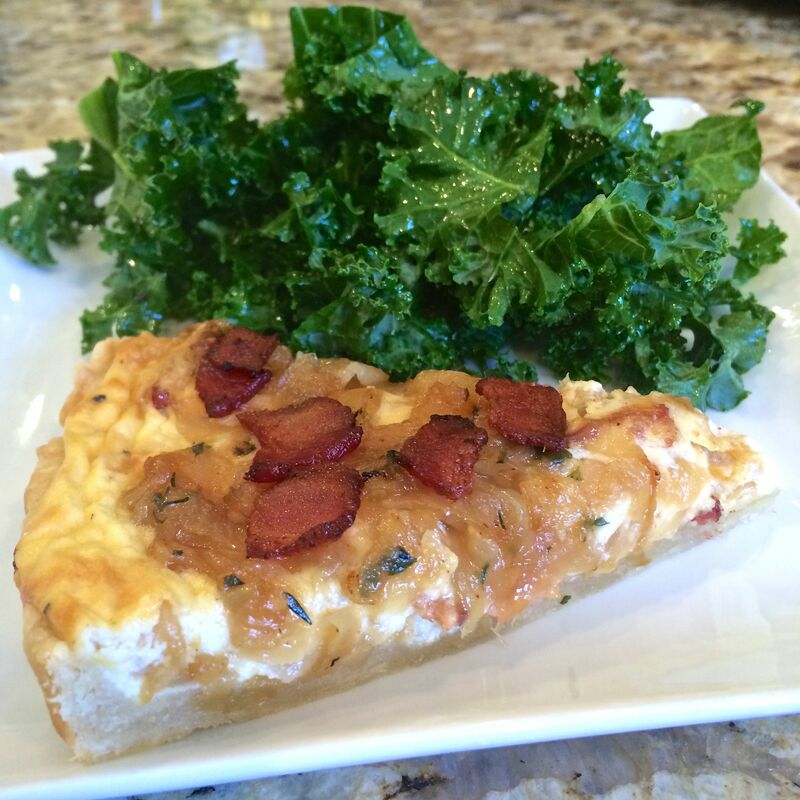 Served with a green salad, this decadent tart is the perfect centerpiece for your next brunch. 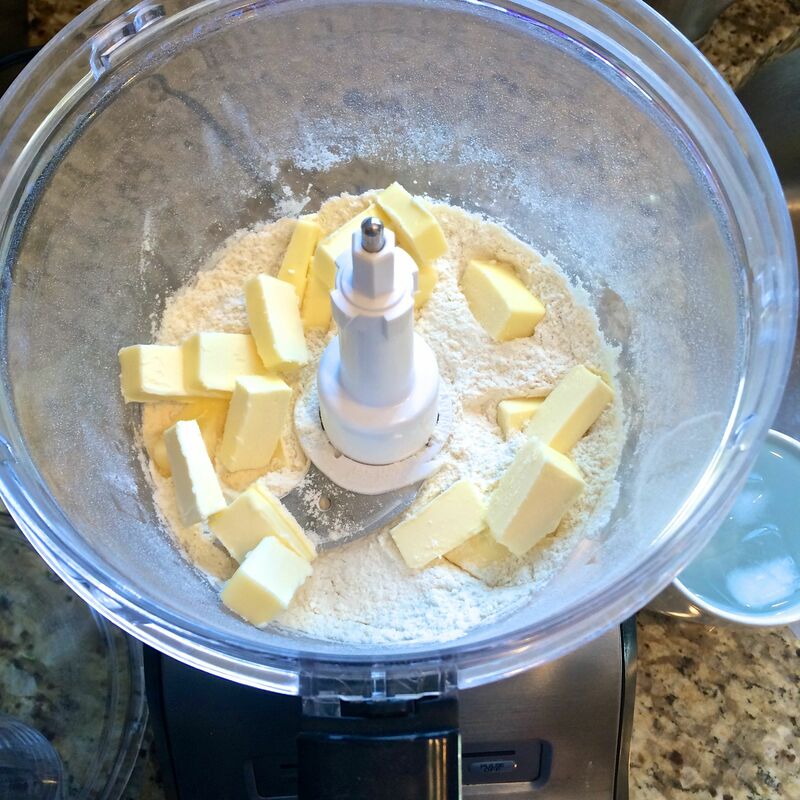 To make the crust, combine the flour, sugar, salt and baking powder in a food processor. Pulse a few times to blend. Add in the butter. Add 6 tablespoons of the water and pulse a few times. Add an additional tablespoon of water at a time, until the dough begins to form a cohesive mixture. I needed 8 tablespoons (half a cup) to get my dough to this state. 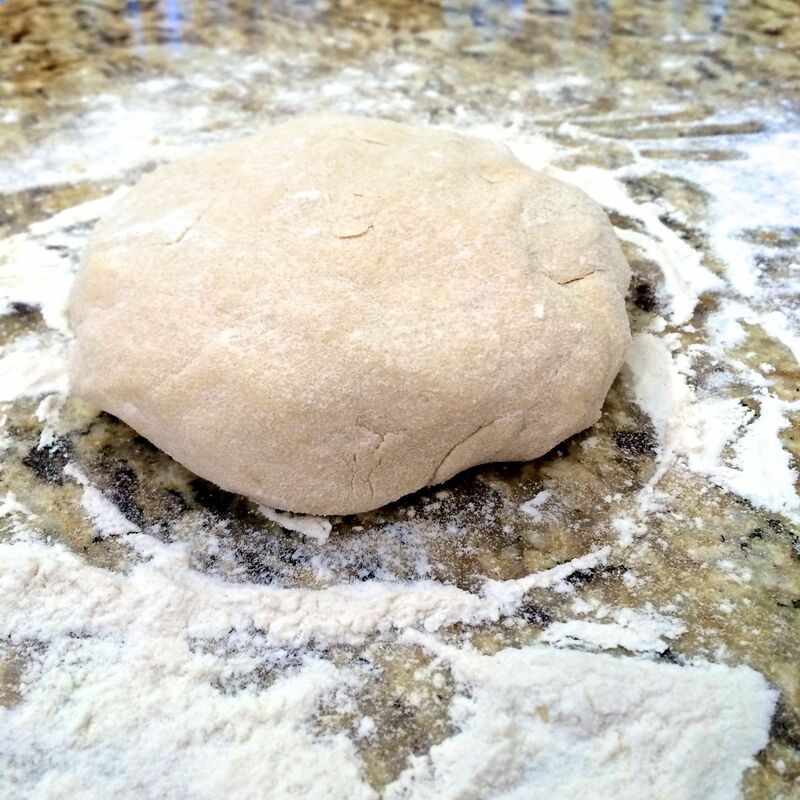 Turn the dough onto a lightly floured work surface and gather it into a ball. Then pat the dough into a disc. Wrap in plastic wrap and refrigerate for at least 30 minutes before rolling out. 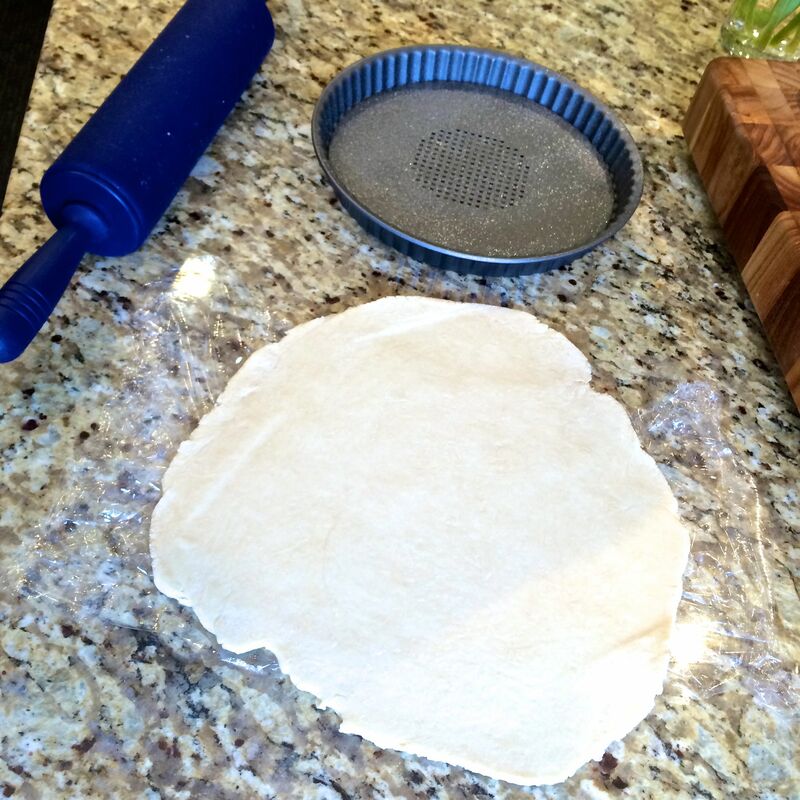 Roll out the crust on a floured surface. 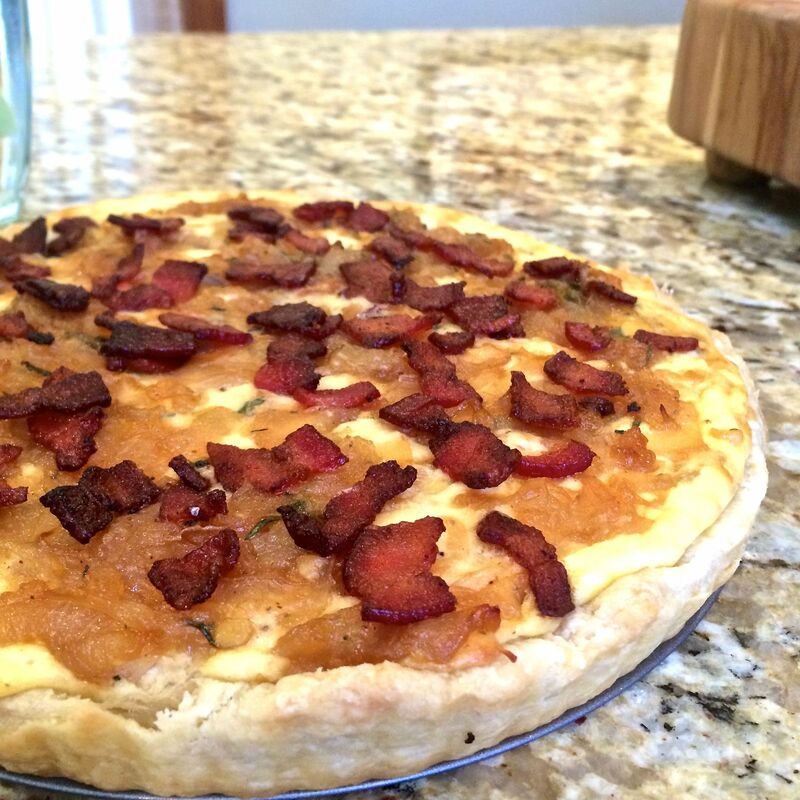 Place into tart pan and prick the bottom of the crust all over with a fork. Put the pan in the refrigerator to chill the crust while you prepare the filling. In a heavy bottomed skillet or dutch oven set over medium heat, melt the butter. 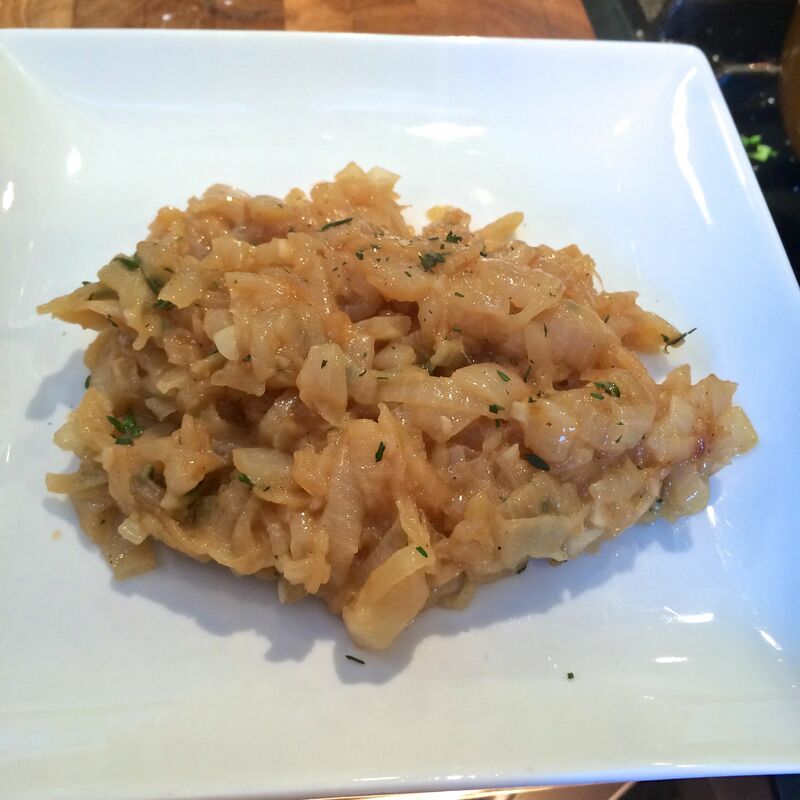 Toss in the onions and cook, stirring occasionally, until caramelized. You will need to exercise patience here, as it takes around 40 minutes to achieve the perfect brown caramelization. Every 5 minutes or so, stir the onions. 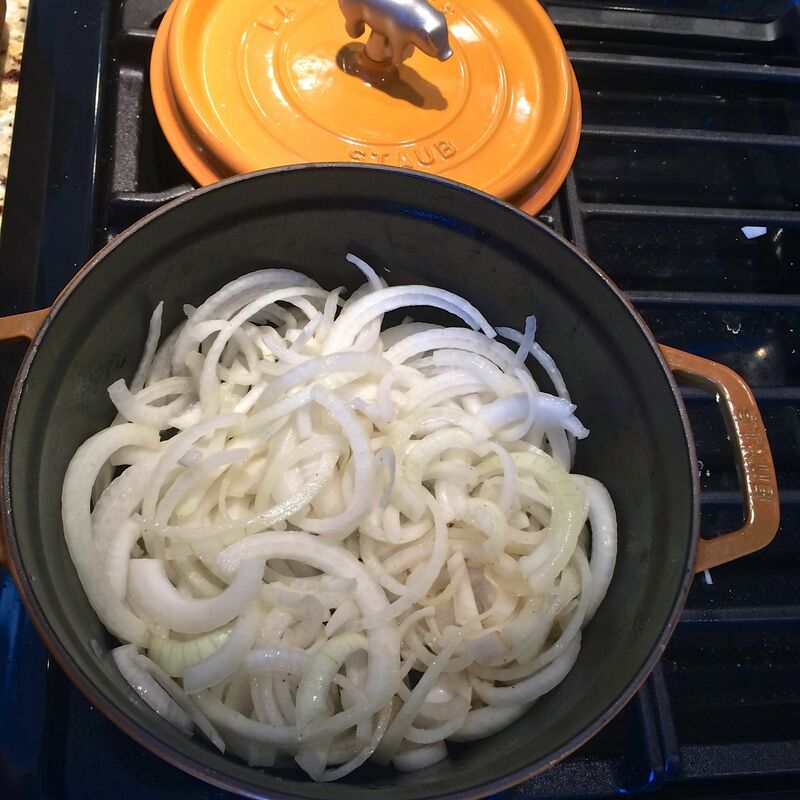 Any time the onions become too dry or start to burn, add a couple tablespoons of water. This will allow the onions to reach their full caramelized potential and not become burnt little bits. 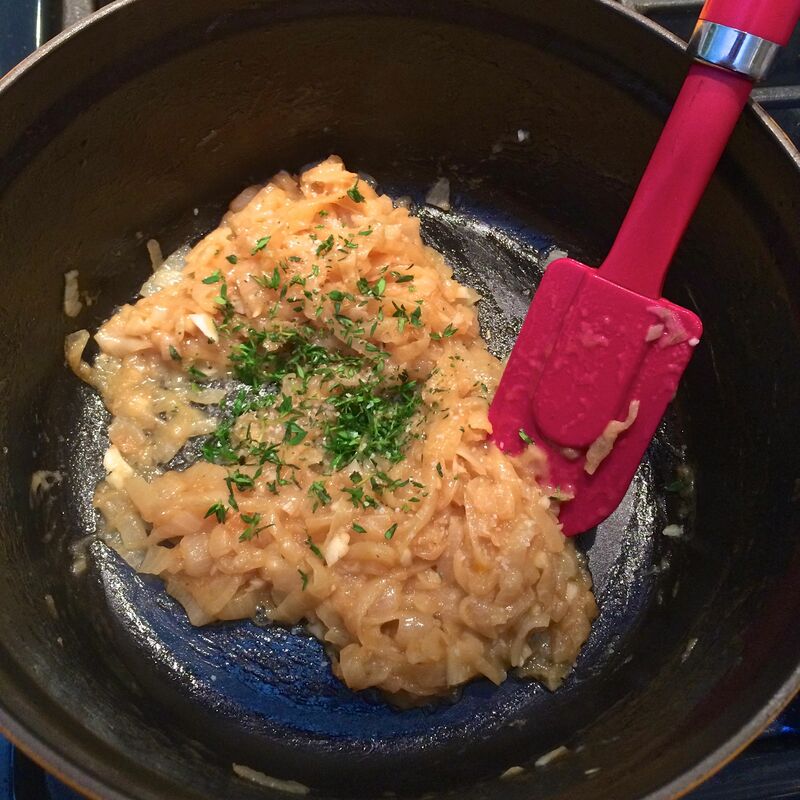 When the onions are caramelized, add the garlic and let cook together for 1-2 minutes. Stir in the thyme leaves, and season with salt and pepper. Scrape the onions onto a plate to cool. Wipe out the skillet and place back on the heat. 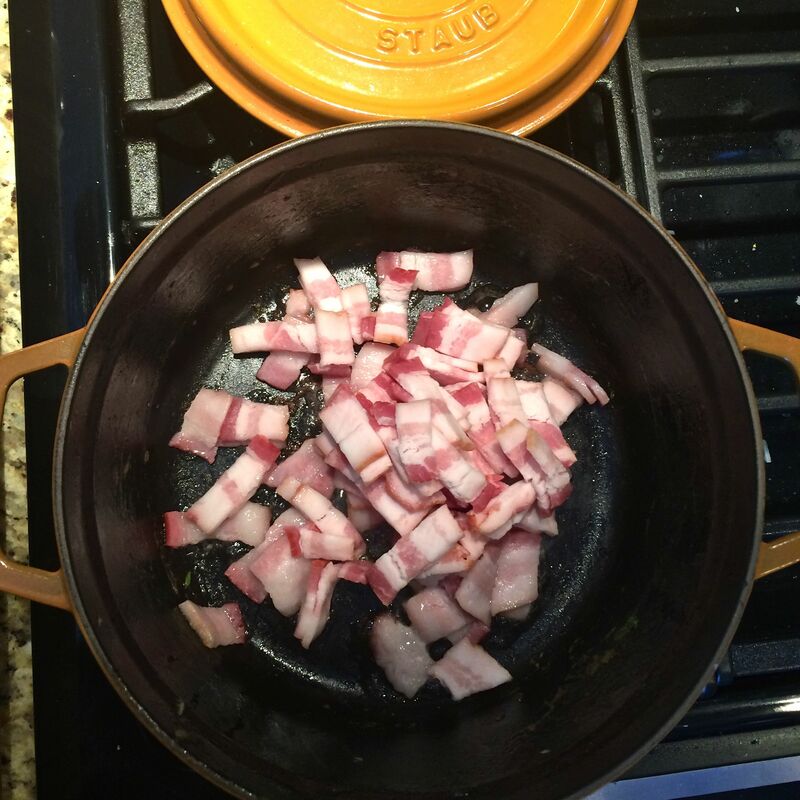 Add the bacon to the skillet. Cook the bacon stirring occasionally, until browned and crisp. 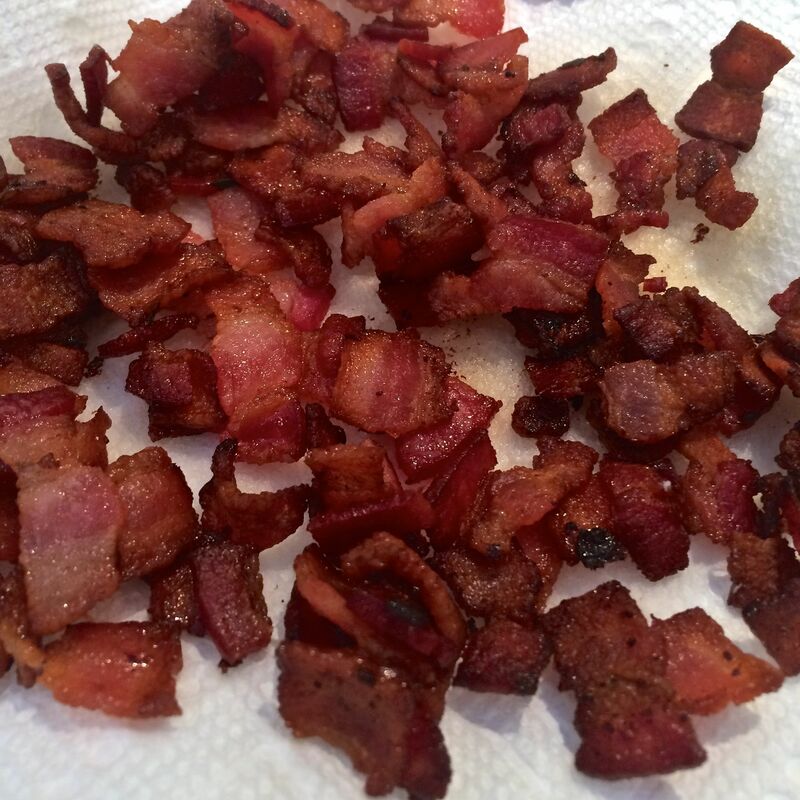 Remove the bacon with a slotted spoon and place onto a paper towel. Preheat the oven to 400 degrees. 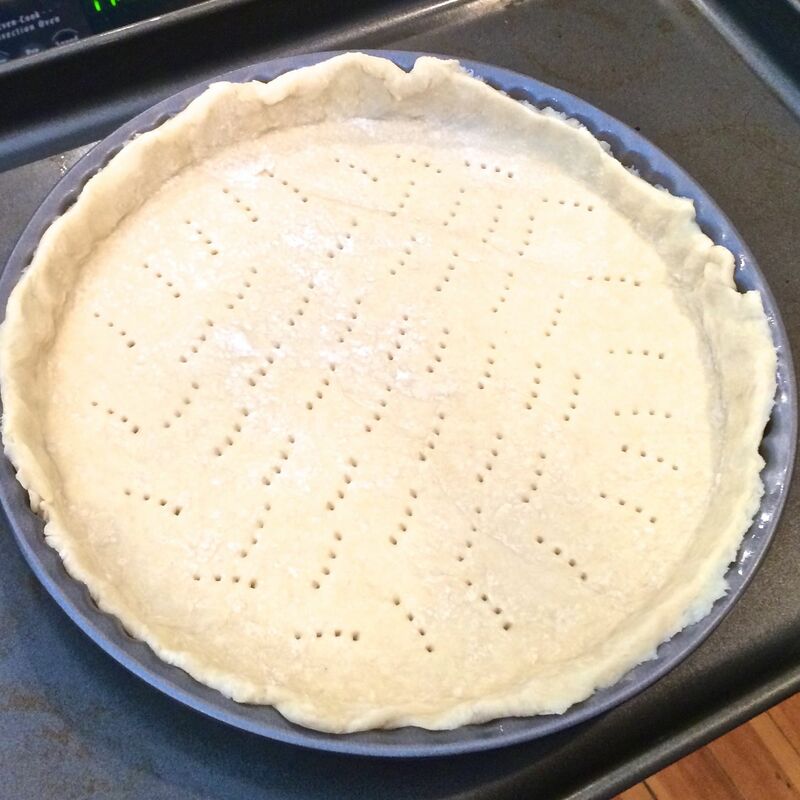 Set the tart pan on a large baking sheet. Bake the crust just until it begins to look dry all over, about 12 minutes. If it bubbles up a bit in spots, just press down the bubbles with a spatula. In a medium bowl, whisk together the ricotta, egg yolk and Parmesan cheese. Season with salt and pepper. Fold in half the onions and half the bacon. Spread the ricotta mixture evenly over the parbaked crust. Spread the remaining onions over the ricotta mixture. Sprinkle the remaining bacon over the top. Bake until the crust is golden on the edges and the ricotta filling is firm, about 30 to 35 minutes. Let the tart cool in the pan before slicing. 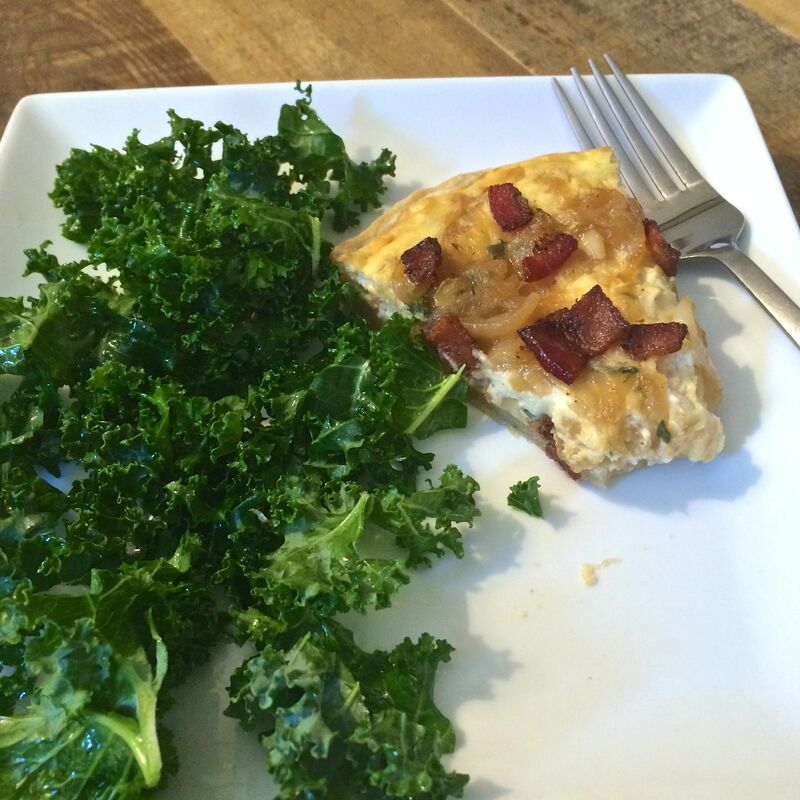 I served the tart slightly warm, with kale that was lightly dressed with olive oil and lemon. Add 6 tablespoons of the water and pulse a few times. 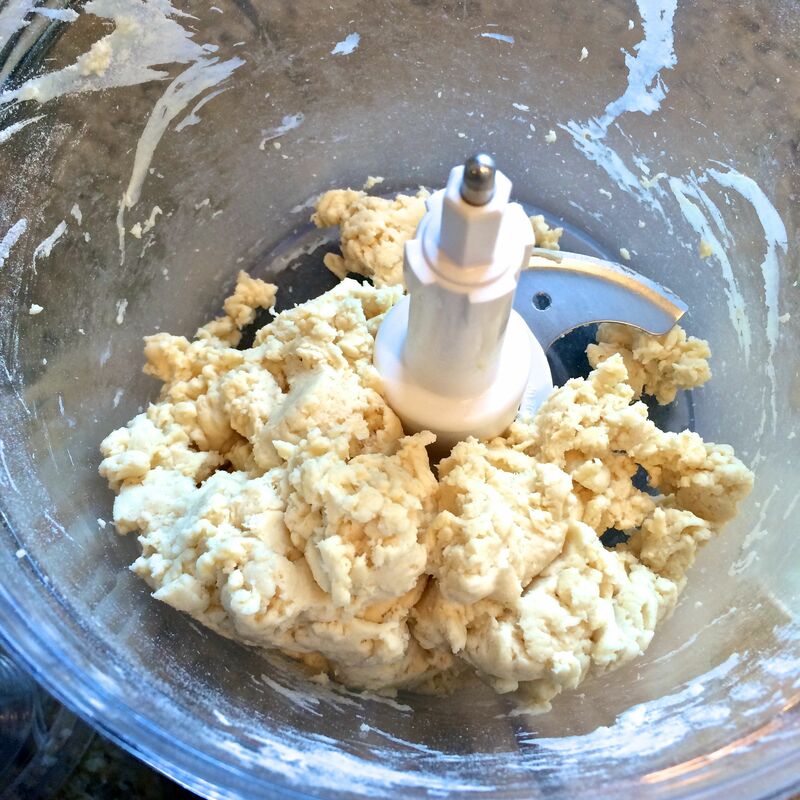 Add an additional tablespoon of water at a time, until the dough begins to form a cohesive mixture. 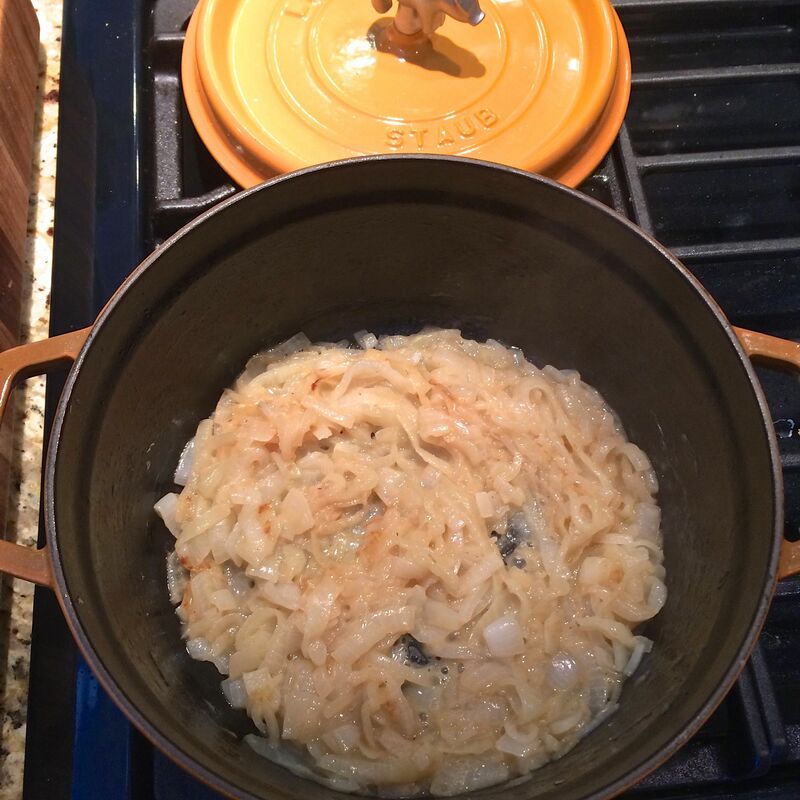 Toss in the onions and cook, stirring occasionally, until caramelized (about 40 minutes). Preheat the oven to 400 degrees. Set the tart pan on a large baking sheet. Bake the crust just until it begins to look dry all over, about 10-12 minutes. 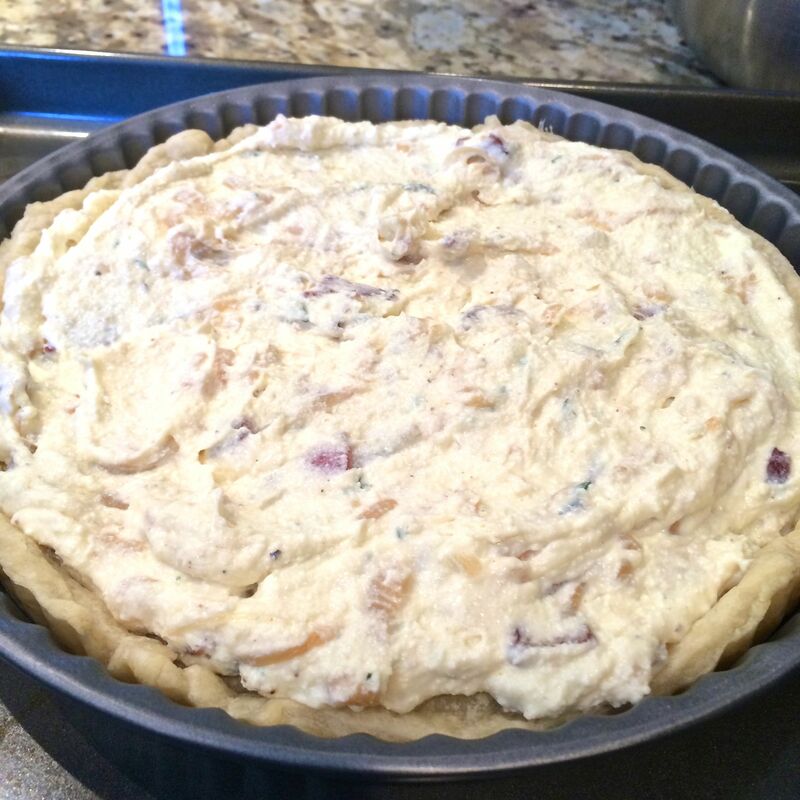 Spread the ricotta mixture evenly over the par-baked crust. 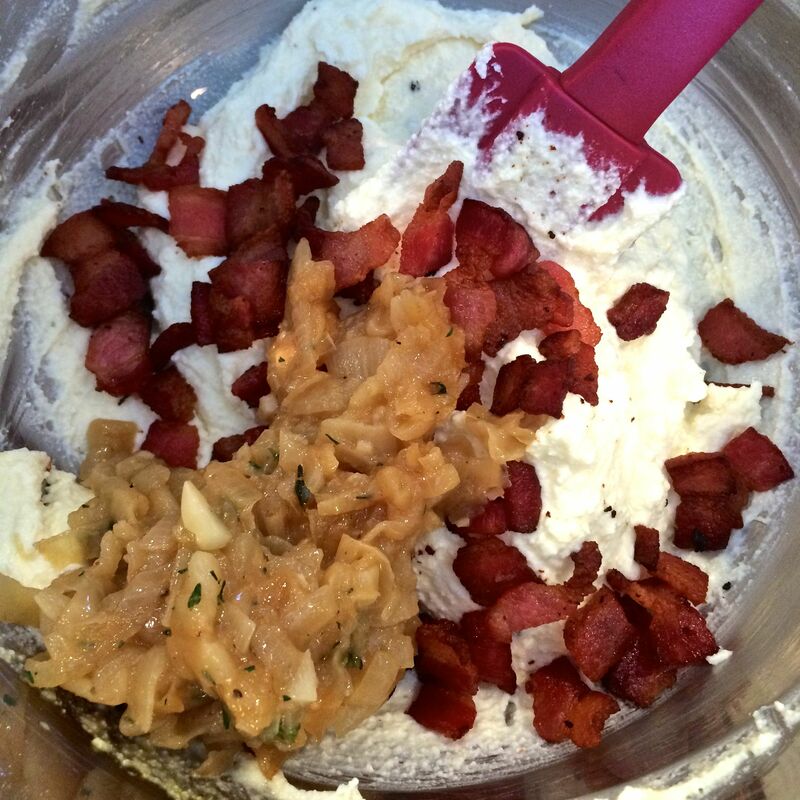 Spread the remaining onions over the ricotta mixture. Sprinkle the remaining bacon over the top. OMG yes to everything about this. Seriously- it looks like heaven. Thanks for sharing at the link up today- I always like seeing what you’ve come up with! I’d swap onions for something else…chocolate? 😉 Not a big fan of onions but bacon? Yes! Lol – no onions even when they’re caramelized?! Hmm….I bet some sautéed mushrooms (or even roasted asparagus) would be the perfect replacement!! !